As the Chief Operating Officer of an American cell phone case manufacturer, I’m intimately familiar with all the in’s and out’s of factory operations. On this day, like usual, the factory floor was abuzz with the whirring of machinery. But when I walked in, I noticed that something was different. To my immediate left, I saw a sea of broken phone cases in a pile on the floor. And there – in the middle of the mess – stood the Chief Engineer and the Factory Foreman who appeared to be having a heated discussion. I stepped in and asked what the problem was. The foreman explained that a specific part was being produced incorrectly. This created flawed cases that had to be rejected because of the imperfections and later fixed by hand. This was resulting in overtime hours, greater expense, and not surprisingly, major stress. The foreman believed the issue was caused by a product design error, so naturally, he wanted the engineering department to fix the problem. He also wanted any overtime expenses to come out of the engineering department budget. However, the engineer squarely placed the blame on a piece of machinery that he believed to be in disrepair. They tried to work it out, but they were at an impasse. And they were looking to me for help. Thankfully, just the week before I had come across a free special report from the Program on Negotiation at Harvard Law School. Within the pages of Negotiation Skills: Negotiation Strategies and Negotiation Techniques to Help You Become a Better Negotiator I discovered negotiation tactics to help me solve problems, ease tensions, and build consensus in the workplace and at the bargaining table. With all of this in mind, I set up a meeting with the engineer and the foreman for later in the week. I knew that to negotiate a solution, we all needed to truly understand the nature of the problem at hand. And by working together, we could get to the bottom of it. After a careful examination, we confirmed that there was a minor design flaw. I negotiated an agreement with the engineer whereby he would stop work on a different project so that his team could focus on retooling the case design immediately. And in the meantime, the foreman acknowledged that his employees did have some free time to fix the flawed cases; therefore, mitigating the overtime expenses. After all was said and done, they shook hands and went back to work. I thought to myself, “If only all negotiations could resolve themselves so smoothly?” And then I remembered that with the right negotiation techniques, they can. Sam’s success story is one we’ve heard time and again at the Program on Negotiation at Harvard Law School. Students who master business negotiation techniques become better leaders. But it starts with building the right skills. And that’s where our latest free report comes in. You can download a complimentary copy of our special report, Negotiation Skills: Negotiation Strategies and Negotiation Techniques to Help You Become a Better Negotiator, right now! 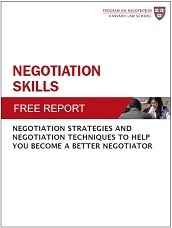 Discover how to handle complicated, high-level business negotiations in this free special report, Negotiation Skills: Negotiation Strategies and Negotiation Techniques to Help You Become a Better Negotiator, from Harvard Law School. Don’t know the answers to these questions? You need this special report. By preparing for a negotiation and anticipating your answers before you’re confronted with a challenging question, you can avoid a costly mistake. 1. Be ready to make mistakes – Negotiation training can be a humbling experience. By embracing your “needs improvement” areas, you can get on the path to becoming a better negotiator. 2. Take a proactive approach – Beyond taking notes, think about how negotiation concepts apply to your own negotiations. By making your learning “real,” you can better apply it outside the classroom. 3. Practice your new skills – It’s true, practice makes perfect. Don’t assume that because you’ve read it in a book, that it will naturally become part of your negotiation skill set. By actively applying new strategies – even if it’s just with your friends and family – you’ll be better able to put your new skills to work when you need them the most. We’ve all faced them before: the toughest negotiators in the room. They’re the ones who make others want to retreat from the bargaining table and head back to their corner offices. But you can be prepared for hard bargainers with Negotiation Skills: Negotiation Strategies and Negotiation Techniques to Help You Become a Better Negotiator. • Join a coalition – Yes, there is strength in numbers. By negotiating as a group, you can gain numerous benefits and greater bargaining power. • Escalate prudently – By taking the negotiation to the next level, you can gain attention…and potentially the upper hand. • Take advantage of deadlines – You can even manufacture a deadline to jump-start stalled negotiations. • Combat negotiation anxiety – When you’re up against a hard bargainer, it’s normal to feel nervous. But you can learn to manage any anxiety and achieve better outcomes. Curated from several articles in Harvard’s Negotiation Briefings newsletter, this report contains the most important, most relevant information you need to negotiate the best outcomes for you and your company. The tools, the strategies, the knowledge, and simply everything you need to become a better negotiator are yours in this free special report. I urge you to download your complimentary copy of Negotiation Skills: Negotiation Strategies and Negotiation Techniques to Help You Become a Better Negotiator, right now. Simply click the button below. With my sincere best wishes for your business negotiation success. P.S. Are you ready for what your next negotiation will hold? Hard bargainers, tough questions, or unexpected nerves – combat them all with this special report. very informative. I was able to do my assignment on negotiation skills and passed with credits. Thanks for the excellent information. Wish I had this about a year earlier when my partner I couldn’t reach a negotiation for the business. It all worked out but what I just read in this report would probably have saved the partnership as both of us were pretty unskilled at negotiation. Thank you for taking the time to put together this report. Really solid, useful information. Robert, this is great! Negotiation has an art to it and I see that you use it very well indeed. I’ll look into your special report, thanks once again. I appreciate your continual contact with my address. I enjoyed a newsletter from you that introduces the theoretical issue on Cross-Cultural Communication Skills for International Business Executives. It really boosts my motivation for course work on communication and investigating socio-linguistics. Last term, I made a research paper on cross- cultural misunderstanding where I found the issue that even experts whose English is quite eloquent both in speaking and writing in mundane interaction or on business scene, they often misunderstand participants’ claim or demand due to their intelligibility. As you indicate in your report, Japanese convention such as bowing often gives a strange impression to the recipients who are not accustomed Japanese-English style. Most Japanese interlocutors are not confident in their intelligibility due to their lack of English language proficiency. And what was worth, Japanese interlocutors often struggle with their pronunciation where they have few opportunities to have conversation with English experts. The problematic issue of Cross-Cultural Communication Skills is worth enough to extend further investigation of interlanguage speakers, and hopefully, it develops the dimension to the problem in sociolinguistics. Thank you for reading. Cross-Cultural Communication Skills for International Business Executives. www.pon.harvard.edu/publications/. Retrieved 24th/May/2015. This seems like a fascinating offer. I remember when I read “How To Get Rich” by Felix Dennis, he mentioned that negotiating was easily one of the top three skills you need to master to become an extremely successful business person. Kindly assist me in the following case, a situation where negotiating teams are expected to use the “Modern Leadership Outlays principle to successfully deal with all the barriers affecting a collective bargaining process.” How do I discuss what constitutes Modern Leadership Outlays and how this concept works well if the negotiating teams have differences.? Simply sign up for email on our site and you will receive articles on a daily basis.